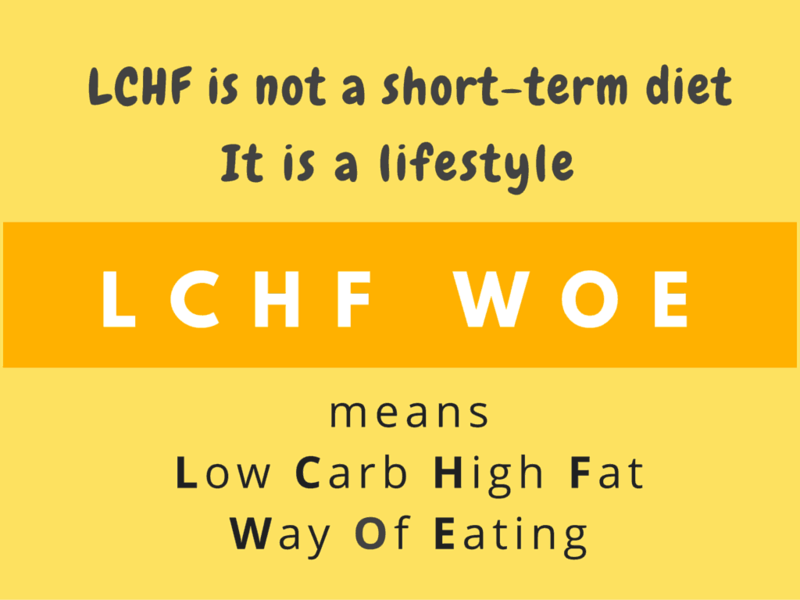 How do I start on the LCHF (low carb high fat) Way of Eating? The other day, a friend remarked on how slimmed down and fit my husband was looking. She already knows that we’re on LCHF. So, I just smiled and said, “Thanks to the fat and protein we’re eating, and the bad carbs that we’ve cut down”. She said, “I know. I just don’t know where to start”. That’s the reason for this section. Here’s how you can start. 1) You can drive straight in. 2) You can go gradually step-by-step. It all depends on your body, the health problems you want to resolve, and your mind. My partner and I did option 1. Clean out your kitchen of unhealthy foods (if you’re doing it as a family). If your family does not join you, and you’re doing it alone, Option 1 might be better. Once your body is accustomed to LCHF foods, you won’t feel hungry all the time. So, it’s easy to resist the temptation that’s around you (family is funny. They may be your greatest support or your greatest opponent). It’s easy to say ‘no’ when your family is having a sugary ice-cream when you’re full and satiated (which you are on LCHF) than when you’re hungry. Do all necessary shopping before you start. Drink lots of water. My general intake is 1 litre/25 kg of body weight. But while starting LCHF, I drank more. Choose when to start, based on the type of person you are. For some of you, it might be better to choose a busy day to start it. That way, you’ll be too busy to think about food. Or you may start on a day off, so that in case you have discomfort, you’re at home and and pass off the time watching movies or reading a book. The first few days may be a bit difficult for some people, as the body makes the switch. I had a migraine headache. In option 1, your body is attempting to switch from ‘glucose-burning mode’ to ‘fat-burning mode’. So, it’s best to go to very low levels of carb consumption. Dr. Atkins and other low-carb proponents call it Phase 1 and suggests 20gms a day for a period of 2 weeks or even a few months, based on how much you want to lose. After that, you may slowly increase carb consumption by a 10gms/day for a week, and see how it affects your weight/blood sugars. After achieving targets, you may want to include higher-carb vegetables, whole grain products or steel-cuts oats or some low-sugar fruits. If the foods that you’re experimenting with don’t affect your numbers, try increasing little by little. See at which point your body starts to gain weight or show higher blood sugar levels. That is probably your “carb tolerance limit”. After finishing phase 1, we gradually increased carb foods (though not by carb counting). As we worked through it, we instinctively understood how our bodies were reacting to the different kinds of carbs. He was tolerating carbs better than I did, because he was not insulin resistant, while I was. Whether you want to go carefully by carb counting (with tables and charts) or not is up to you. Do these step by step. Step 1: Cut out sugar. ALL sugar. Don’t add sugar in anything, – not even in your coffee, tea, lime juice. Cut out everything whose label says sugar. Here are the other names for sugar. You’ll be surprised at the products that do have sugar – sauce, ketch-up, salad dressing, mayonnaise, soup, yoghurt (even unflavoured), anything that says ‘low-fat’. When you’re comfortable doing step 1 (a month or two), go to Step 2. Step 2: Cut out ‘refined’ and ‘simple’ carbohydrates. Avoid rice, wheat and other grains. Don’t eat anything made of flour either (rice flour, whole wheat flour, maida flour etc). It’s best if your source of carbohydrates is low-carb vegetables. You had already cut out the sugar in Step 1. In this step, you’re cutting out starch as well. Of the 3 forms of carbohydrates, the fibrous is the least fattening. (Don’t overeat fibres, if it causes constipation). Step 3: Reduce sugary fruits (more so if you’re insulin resistance. If not, there may be no harm in eating them occasionally, after you’ve achieved target weight). Fruits are not what they used to be. They are scientifically modified to taste much sweeter (fructose is still sugar, you see), and they’re treated with preservatives to make them last much, much longer. I once had an apple in the fridge for 5 months!! Only the skin was slightly wrinkled. After peeling the skin off, the inside of the apple was crunchy and fresh. I once saw a program in TV5 Monde, where an apple farmer showed how he treated the apples in a gas chamber for many hours to make it last for one whole year!! (The gas is toxic, and people don’t go into that chamber!!). Avoid dried fruit as well. It has much fructose. Step 4: Reduce overall carbohydrate intake. Increase fat intake at each of the above stages. Please make sure that you include soups and supplements. Till you achieve target weight (or any other target numbers – cholesterol, blood glucose/insulin etc), stay faithful to the plan. Avoid people, places and occasions that may cause you to break this WOE. Once you’ve achieved what you want, you can relax once in a while. You’ll find that you don’t want to eat ‘carbage’ anymore. Your cravings would have disappeared. But if you still want to eat some higher-carb meal or dessert once in a while when you feel like it, go ahead and indulge. If you’re not insulin resistant, you might even decide to consume the recommended number of teaspoons of sugar a day or whole grain products or steel-cut oats. But keep in mind that sugar and high-carb foods are addictive in nature. So, unless you’re sure that you can stop with one, don’t indulge. Sometimes, your body is so adapted to this healthy WOE, that a high carb meal might give you unpleasant side-effects like a headache, indigestion, or even skin rashes. Observe what kinds of foods induce these reactions and avoid them. After years of thinking otherwise, it is difficult to add fat in your meals. Get out of this thinking. Be liberal with good fats. Otherwise, you will stall soon or you might even start gaining weight. You’ll also feel tired, hungry and cranky if you limit fat. Don’t let the clock dictate meal-times. Listen to your body. We’re also used to “eating on time”. Growing up, we were raised to think that we didn’t eat on time, it meant that we were ‘indisciplined’. Eating on time showed that we were disciplined and orderly. Moreover, on a high-carb diet, you need to refuel every 3 or 4 hours. But on the LCHF WOE, since your body is adapted to fat-burning, you’ll not feel hungry so often. So eat only when you’re hungry and stop when feel full. When you add sufficient fat in your meals, you’ll feel full very soon, my friend. You’ll be surprised at the small portion size that can easily satiate you, and the longer durations you can go without feeling hungry. If you’re consuming packaged, processed foods (which are better avoided IMHO), please read the labels. Don’t just read the nutrition table, read the ingredient list. Look out for ingredients like vegetable oil, sugar, other names for sugar and other unhealthy or ambiguous ingredients. I’m not sure what vegetable oils are doing in “frozen dessert” like Kwality Walls (here’s the reason they’re not labeled ‘ice cream’) or in Coffee Creamer (We used Nestle Coffee mate for quite a few years, till one fine day I read the label and was shocked that it contained trans fat vegetable oils) . If you must count anything, let it be the carbs, especially refined carbs. Stop counting calories.